For many, many DJs, Pioneer simply owns the DJ booth. The ability to work with Recordbox on the computer, drop a USB stick in a bag, and then just plug into the ubiquitous CDJ is a level of convenience no one else can match. (Seriously, what other gig can you play with something you can fit in your pocket, unless you’re a harmonica player or beat poet?) But that raises the question – what can Pioneer do beyond their enormously successful mixers and digital players? The answer: they may now be set to extend that dominance. We got one answer to this in 2014, when Pioneer moved into turntables with the PLX-1000. And Pioneer proved adept in the phonograph business: many DJs I know feel the PLX exceeds even the iconic Technics 1200. Now, having brought the high-torque direct drive turntable back from the dead, Pioneer is moving into another category others have abandoned. 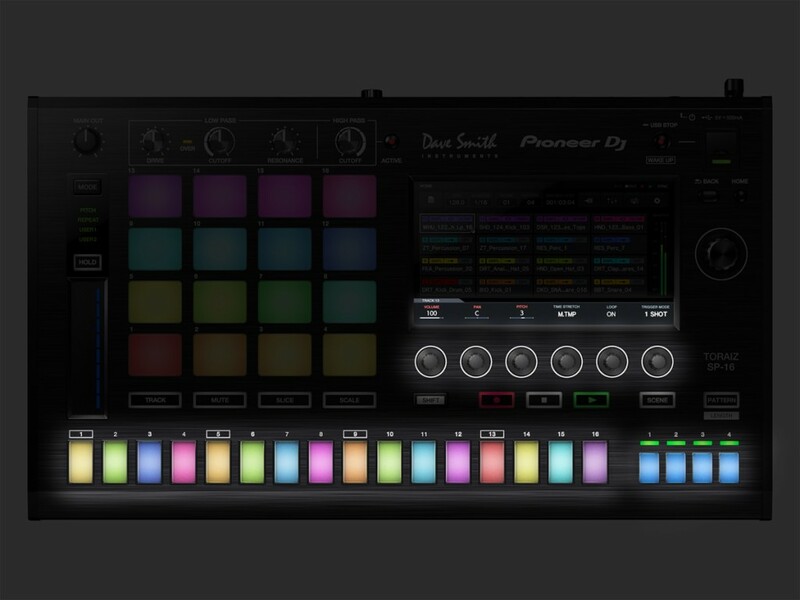 While Native Instruments and Akai ship drum machines that rely on your computer to operate, Pioneer is shipping a modern, standalone sampler/sequencer. 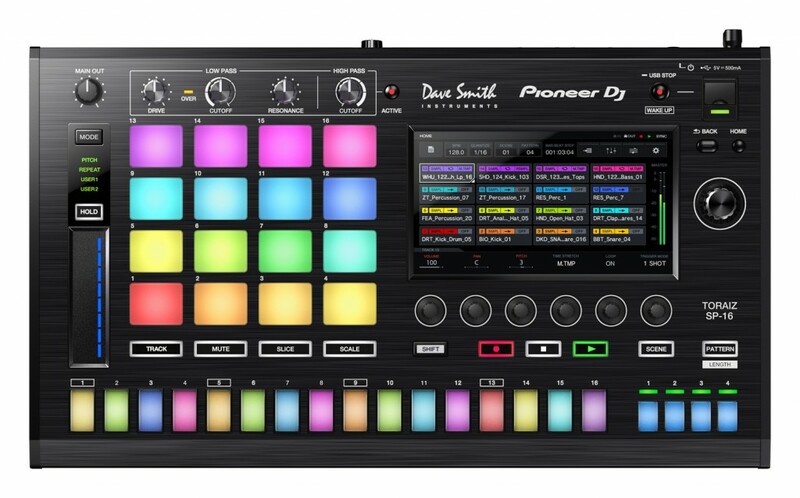 That should already make MPC fans go wild – long disappointed by Akai’s unwillingness to make new hardware. But as if that weren’t enough, Pioneer also has this ace in the hole: they can bake “Pro DJ Link” right into the hardware so you can plug and play with CDJs. The filters are apparently a big deal to Pioneer, who make it a banner feature of the instrument and will feature Dave Smith himself at Musikmesse. The low-pass filter has resonance and drive controls. The filter comes from the Prophet-6 synth. Pricing, suggested retail: €1599 / £1279 / $1499, due in summer. 4×4 RGB pads, of course, which you can use with or without velocity. (Disco pads seem a necessary feature these days. x0x-style step sequencing on the bottom, in addition to the MPC-style pad layout. A whole lot of sample storage: 8GB of flash memory are built in, with 2GB of samples from Loopmasters pre-loaded. Amp envelope and time stretching. I’m curious to hear how good the time stretching algorithms sound. USB and MIDI DIN (in and out/thru) onboard. 8 audio outputs, 2 audio inputs, phone jack. And it’s nicely portable: 436.5 x 261.2 x 74.3 mm (W x D x H), 3.2 kg. I do suspect it’s not entirely finished, as some of the specs seemed unclear. From the press photo cache, an interesting look at how the macro controls appear to work – and with the x0x-style step sequencer. I have a lot of questions, which I’ll try to answer in Frankfurt Thursday and in communications with Pioneer and Dave Smith. For one, I’m curious about how you’ll load samples onto the device. It does have inputs onboard, which suggests sampling from external sources – that’s also huge, and I’m curious to see how it works. They also haven’t revealed much about the sound design functionality or mixing/effects architecture of the instrument, apart from letting us know we can route sounds through the two filters. All of this makes an appealing musical instrument, and being a standalone device may already win over fans for the studio or live shows. But where Pioneer has an advantage is being able to market the same box to DJs – and make an argument that they could use the product in hybrid DJ/live sets. With audiences tiring of the same old routine, and a market ever more crowded with DJs (partly thanks to the ease of the CDJ), that could be a differentiation point. And that’s where Pioneer’s own sync protocol gives them an edge. The SP-16 does support convention MIDI clock. But it also of course has Pioneer’s Pro DJ Link. The protocol uses Ethernet LAN cables to connect clock, transport, and beat information between decks. And it works across all recent Pioneer CDJ and mixer products. That means you will be able to bring an SP-16 to a gig, plug in via Ethernet, and then have turnkey sync support with the CDJs at a venue. All you’ll need is an Ethernet cable (and enough space to set your SP-16 in the booth). The sync option is really nice: Pioneer says loops and one-shots are synced to the beat clock of the CDJ or XDJ. This PDF explains how connection works. Now, sure, the CDJ-2000nexus “sync button” is already something a bit controversial. And, sure, just as DJ traditionalists would say you should beatmatch rather than hit sync on a CDJ, they might also say you should be able to beatmatch with a drum machine or other device. I don’t care what they say: I think the market has spoken, and DJs are glad for this kind of convenience. We live in a digital age where we expect our expensive machines to be smart enough to sync with one another. And as more of them do sync, and sync better, that expectation will only accelerate. This, of course, raises a question: will sync be the exclusive domain of stuff with Pioneer logos on? Pioneer notes you’ll need to flash the SP-16 to the latest firmware to use Pro DJ Link, and makes some vague promises about future sync to DAWs and other tools. That may not be as far-fetched as it sounds. Pioneer and Ableton are naturally complementary: Pioneer is in DJing, not production, and Ableton Live is more a production and performance tool than anything like a CDJ or Rekordbox. And there’s nothing preventing Link from working in hardware – indeed, Pro DJ Link works over a network transport just as Ableton Link does. Having a hardware drum machine that synced effortlessly with a computer, minus the usual hassle of MIDI clock, would be a huge boon. I have no idea whether it could happen or not, but I do think a business case for the collaboration could be made at either company. And, of course, all of this is a bit of a blow for Akai and Native Instruments – Pioneer got their first (or, in the case of Akai, uh … after Akai had left). Each have products that could work standalone; Akai in particular have legions of MPC fans who have been clamoring for something standalone. And with standalone hardware able to do more of the things that once only a computer could, the ongoing trend to standalone devices continues. I think the laptop value proposition and flexibility mean that software is going nowhere, but then it’s also nice to make hardware that is free from the burdens of OS updates and unpredictable performance. It’s certainly a unit to watch. The price point means Elektron is still competition. But if they nailed the workflow, I’m sure the Pioneer piece is going to be an enormous hit.